Thank you for your e-mail of July 23. 1. The quality or attribute of being infinite or having no limit; boundlessness, illimitableness (esp. as an attribute of Deity). 3. b. Phr. to infinity (= L. ad or in infinitum): to an “infinite” extent, “endlessly", without limit. 4. a. Math. Infinite quantity (see infinite A. 4 c): denoted by the symbol <infin>. Also, an infinite number (of something; quot. 1831). 4. b. Geom. Infinite distance, or that portion or region of space which is infinitely distant: usually in phr. at infinity. In Photogr. also used of any distance, or the range of distances, at which an object is effectively in focus when the lens is set for the greatest possible distance. Using this definition, one can easily gain an appreciation for infinity by examining the use of the word infinity in photography: Once the lens is set an infinity, you cannot make distant objects appear sharper by focussing more on infinity. Thus, the concept of infinity is “arbitrary” to the extent that there is no “infinity plus one,” because infinity is already “large enough” to contain “infinity plus one.” In other words, infinity can't be defined other than conceptually. As for your example of the ticking angel, I think you have conflated two different concepts. While you seem to be attempting to bolster your concept of infinity, you have slipped over into a discussion of the concept of time. Although no one yet knows for certain, it seems that the “arrow of time” points only one direction. For what it’s worth, I define time as “the measurement of motion.” Stephen Hawking talks about this in his famous book, the title of which I've forgotten, but which is something like, “A Brief History of Time,” or some such. My view, however, is that once something has moved, there is no way it can “unmove,” as both the original movement and the “unmovement” are movement, which can be measured and thus which each exist in time; the “unmovement” does not negate the movement. Also, and this is a small matter, I reject your attempt to shift the burden of “unproof” to me with your statement that my arguments are not very damaging to the Kalam proof that God must exist. Technically, I don't have to prove that God doesn't exist, and in fact, it is virtually impossible to prove a negative. It is up to the person making the extraordinary claim — in this case, it is you — to prove his point. Citing the Kalam argument is hardly proof of the existence of an all-powerful, timeless diety. I realized that the circle and the Koch snowflake were not what I would call true infinities. I presented them, in that specific order, so as to ease us into an understanding of what we are up against in dealing with infinity. Can an infinite task ever be done or completed? If in order to reach a certain end, infinitely many steps had to precede it, could the end ever be reached? Of course not — not even in an infinite time. For an infinite time would be unending, just as the steps would be. In other words, no end would ever be reached. The task would — could — never be completed. But what about a sufficiently large FINITE task? There are roughly 10,000,000,000,000,000,000,000,000 (10 to the 24th power) atoms per cubic centimeter of matter. The sun’s mass is roughly 2 billion billion billion tons, which is about average for known stars. Normal galaxies, such as our own Milky Way galaxy, have between 1 million and 10 trillion solar masses. The Milky Way galaxy is just one of billions of galaxies known or thought to exist, plus there are planets, comets, dust, asteroids, moons, dark matter, etc. Photo from the Hubble Space Telescope of 1.8 arc seconds of space. “This photo was created with support to Space Telescope Science Institute, operated by the Association of Universities for Research in Astronomy, Inc., from NASA contract NAS5-26555, and is reproduced with permission from AURA/STScI." All of this makes up some large, but presumably finite, number of atoms. Question: Can you count the number of atoms in the known universe? I'll bet you can't, but not because I believe the universe is infinite. The problem is not one of infinities, but of our ability, as finite beings, to comprehend even large finite constructs, let alone a potentially infinite construct. In my first rebuttal I cited this as the main failing of the Kalam argument. The spiral galaxy M100, which contains hundreds of billions of stars. “This photo was created with support to Space Telescope Science Institute, operated by the Association of Universities for Research in Astronomy, Inc., from NASA contract NAS5-26555, and is reproduced with permission from AURA/STScI." The Mandelbrot curve does only represent a portion of its view of infinity at any given time, but that does not mean it is not infinite. When you look up at the night sky, you see only a portion of that sky. 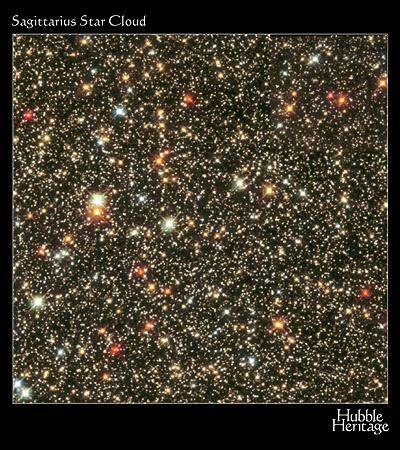 In fact, it is impossible to see any more than a relatively tiny portion of that sky which is visible to the naked eye. This doesn't mean that the universe isn't infinite. But we as humans are not able to observe infinity, no matter how it manifests itself. We must be content with frozen moments, or pieces of infinity. The Mandelbrot curve is valuable if for no other reason than for helping to illustrate this reality: If you want to look at more “infinity” using the Mandelbrot curve, plug in different variables. One is tempted to say that given enough time, one could plug in an infinite number of different variables. Therefore, not only is “infinity” a mathmatical concept that may not have any corrolary in reality, but we as human beings are thus far incapable of comprehensively dealing with even modestly large finite sets, let alone infinities. Given this, why draw the line at infinity when attempting to demonstrate the existence of God? Why not select some sufficiently large finite number as the human limit, ascribing to God everything beyond that limit? For practical purposes, the end result is the same, although without the straw man of a misdefined infinity to attack, the Kalam argument loses its veneer of philosophical sophistication and descends to the level of superstitious mumbo-jumbo. Finally, you say that for the universe to be brought into existence, there must have been more than the potential for it to exist, there must have been something actual. I think you misunderstood my point. If you have cement, sand, aggregate, water, some tools, and someone to mix the components together, you have the potential to make concrete. These are actual items, but if they are not combined, you won't have any concrete. Similarly, I believe that all we can say about the creation of the universe is that there must have been the potential for it to be created, although I have no idea what the actual nature of that potential might have been. It might have been God, a “big bang” from an unimagineably small “singularity,” a tear in the space-time continuum that allowed a universe-worth of material to pour out from some alternate form of existence, or it could have simply always been whirling around in space. Up until now, however, your arguments seemed to be that God is (or at least, was) outside the spatio-temporal realm, that is, he could not be said to exist, at least by our definition of existence. Now, you seem to be saying that God existed to the point that he was “actual.” That is, that he was quantifiable in some way, shape, or form. If that is so, then he was NOT outside the realm of time, and because he can be said to have existed, faces the same problems with origin that you decry in the secular version of the origin of the universe.